Home Magazine Columns Gene Trends: Which Ones Should You Be Studying Now? Gene Trends: Which Ones Should You Be Studying Now? Find out which genes are the most popular. Ten years after the sequencing of the first human genome, the human gene universe remains elusive. GeneCards, an automatically mined human gene compendium, has about 95,000 gene entries, but as of yet only 35,000 got the approval (and official symbol) of the Human Gene Nomenclature committee (HGNC). A great majority of the unapproved entries belongs to nonprotein coding RNA genes, an arena for future scrutiny. Of the ~22,000 protein-coding genes in GeneCards, about 1/3 are scantly annotated. Conveying gene-centric data from 110 web-based sources, GeneCards portrays web cards with annotations and has search capacities to help leverage this information. One facet of GeneCards is as a tool for following gene popularity trends, showing in real time which genes have become desirable search targets. The upcoming series of articles will highlight to GEN readers those genes that have become worthy of attention. The top-scoring gene in terms of enhanced GeneCards popularity in the month of August (Figure) is SAT1 – spermidine/spermine N1-acetyltransferase 1. Researching the possible reason for its enhanced status this month, one finds a paper by AB Niculescu and his group from Indiana University, entitled “Discovery and validation of blood biomarkers for suicidality”1. This paper reports a microarray study of differential gene expression, comparing controls with subjects afflicted with suicide ideation (unusual preoccupation with suicide), whereby the top-scoring gene, after robust statistical filtering, is SAT1. The result was corroborated by biomarker comparisons involving suicide completers, those who actually committed suicide. 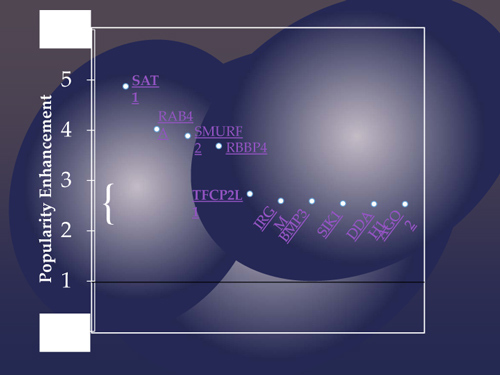 A second paper likely contributing to the SAT1 popularity peak, by G Turecki and colleagues2, identified several miRNAs that target the 3’UTR of SAT1. Several of these regulatory noncoding RNAs, shown by the authors to actually control the expression of SAT1, revealed significant up-regulation in the prefrontal cortex of suicide completers compared to controls. The paper especially highlights miR-320c (MIR320C1/MIR320C2), the only one in the highlighted group of miRNAs that is apparently primate-specific, consistent with a role in higher cognitive function. SAT1 is an enzyme of polyamine metabolism, converting spermidine and spermine to their acylated forms, thus playing a role in polyamine catabolism and interconversion. There is considerable prior evidence for a role of polyamines such as putrescine, spermidine, and spermine in human depression and suicidal behavior3. The new publications strengthen the possible role of SAT1 as a significant “suicide gene”. A second gene highlighted by enhanced GeneCards user access is TFCP2L1—transcription factor CP2-like 1. This is a paralog of TFCP2, the alpha-globin transcription factor CP2, originally named for it being a CCAAT-binding Protein. Two back-to-back papers and a news item, all in EMBO J.4-6, describe novel insights on the function of TFCP2L1, addressing the relationship between intrinsic and extrinsic regulators of stem cell pluripotency. Mouse embryonic stem cell self-renewal may be maintained via activation by LIF (leukemia inhibitor factor) and its downstream component STAT3 (signal transducer and activator of transcription 3), as well as through controlling the negative inputs from GSK3 (glycogen synthase kinase 3) and MEK (mitogen-activated protein kinase kinase) signaling. Combinations of these proteins are used to maintain cultured embryonic stem cells in an undifferentiated state. It was suspected that both inputs converge upon a common transcription mechanism. Now it was shown that constitutive expression of TFCP2L1 effectively substituted for LIF/STAT3 action in sustaining clonal self-renewal and pluripotency5. In parallel, TFCP2L1 was found as the bridge connecting LIF/STAT3 to GSK3 and MEK signaling, as overexpression of TFCP2L1 alone was shown to be sufficient to overcome the need for either6. Scrutinizing LifeMap Discovery, the embryonic development and stem cell compendium, TFCP2L1 is found to be expressed in embryonic inner cell mass, as well as in specific embryonic and adult tissues such as kidney, reflecting roles along embryonic development. The recent reports highlight a case in which a relatively mundane transcription factor is surprisingly found to play a central role at the earliest crucial stages of embryogenesis. GeneCards also includes a Hot Genes table, which shows the 500 most popular genes among the database users since July 2012. The list is updated every day and highlights genes of unusual long-term user interest. The presently shown analysis provides complementary information concerning recent short-term interest. The 10 genes thus highlighted (Figure) represent diverse biomedical context. This may be ascertained through the use of GeneDecks Set Distiller, a gene-set analysis tool that seeks shared annotative attributes among genes. Notably, no term in the GeneCards index was found to be shared by more than three genes in the list. Figure. 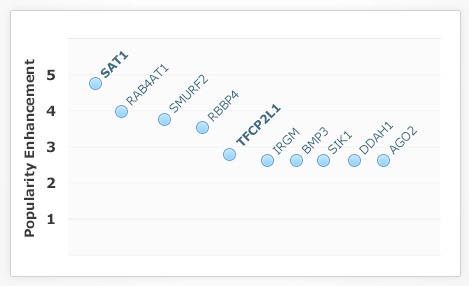 The 10 top-scoring genes in terms of enhanced GeneCards popularity in the month of August 2013. The score on the vertical axis is computed as the ratio of users visiting a gene webcard during August as compared to the average visits in the prior six months. Doron Lancet and Gil Stelzer work in the Department of Molecular Genetics at the Weizmann Institute of Science. Yaron Golan works for LifeMap Sciences. 1 Le-Niculescu, H., et al., Discovery and validation of blood biomarkers for suicidality. Mol Psychiatry, 2013. 2 Lopez, J.P., et al., Regulatory role of miRNAs in polyamine gene expression in the prefrontal cortex of depressed suicide completers. Int J Neuropsychopharmacol, 2013, Sep 12: 1–10. 3 Gross, J.A. and G. Turecki, Suicide and the Polyamine System. CNS Neurol Disord Drug Targets, 2013. 4 Adachi, K. and H. Niwa, A liaison between intrinsic and extrinsic regulators of pluripotency. EMBO J, 2013, vol. 32: 2531–2532. 5 Martello, G., P. Bertone, and A. Smith, Identification of the missing pluripotency mediator downstream of leukaemia inhibitory factor. EMBO J, 2013, vol. 32: 2561–2574. 6 Ye, S., et al., Embryonic stem cell self-renewal pathways converge on the transcription factor Tfcp2l1. EMBO J, 2013, vol. 32: 2548–2560.